The day was cool and cloudy with temps in the low 50’s. There was no hope that the intimate wedding that would be conducted at the gorgeous Four Seasons Resort Orlando would go off as planned since it was to be held at their scenic Lakeside Promenade. That morning was just too cool. No worries though, since the resort has many bad weather options. However, as the day progressed, things started to change. And by ceremony time the skies were blue and the sun was heating everything to a wonderful 72 degrees. That suited Daniel and Gabriella just perfectly! They had just been engaged a few days earlier, although they had been planning their “escape” wedding for several months. Thanks to the wonderful customer service at the Four Season Resort and the fantastic photography of Jacob from Victoria Angela Photography, all went well. Greenery Productions provided the fabulous bridal bouquet and there was even a champagne toast at the end as is shown in the attached photo. 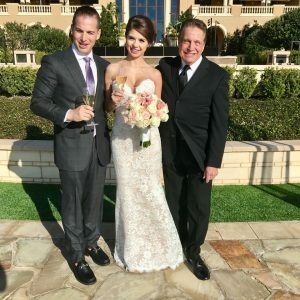 Lon Tosi of the Orlando team of Sensational Ceremonies contacted Daniel and Gabriella on the same day that they were engaged. Lon currently resides in Celebration, Florida. He spent time with Daniel in determining what type of ceremony the couple would like. With that input, he created a beautiful wedding ceremony that brought emotion and depth to their special moment. Their ceremony spoke of Happiness in Marriage and how to achieve it! That reading ended with very true words. They are: “Act happy and happiness will act like it has found you!” From the Nightmare Before Christmas there are such touching words: “My dearest friend, if you don’t mind, I’d like to join you by my side, where we could gaze into the stars and sit together, no and forever. For it plain as anyone can see. We’re simply meant to be.” We could not imagine a more beautiful ceremony for this beautiful couple. We wish you much luck and happiness Daniel and Gabriella! The couple was planning to spend part of their honeymoon at the Walt Disney World Resort in Orlando.